Another problem for Carnival Cruise Lines as one of its ships has developed another engine problem mid-cruise. The Port Canaveral based Carnival Dream, one of the line’s newer and largest ships, was on the return leg of a seven-day Eastern Caribbean sailing is now docked in St. Maarten. Passengers have reported to various media outlets that toilets were overflowing and elevators were shut down and the overall atmosphere on board was very bad as little information was being relayed by the crew. A U.S. Coast Guard spokesperson stated Thursday that Carnival Dream’s captain notified the agency of possible trouble with the ship’s propulsion system. The ship’s emergency generator, which powers propulsion for ship, has reportedly failed. The Coast Guard said they have been reassured by the ship’s captain that their main generator and sewage systems are unaffected by the failure. The Carnival Dream is the latest in a serious of unfortunate events for Carnival. 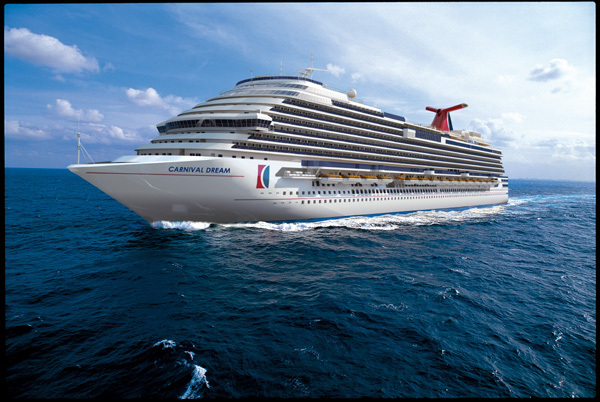 Last month an engine fire crippled the Carnival Triumph in the Gulf of Mexico. More than 4,200 people were left without working toilets or power for several days as the ship was towed to Mobile, Alabama. In 2010, a similar incident happened to Carnival Splendor off the Mexican Riviera carrying 3,299 passengers. Wow. I wonder why people insists on cruising with Carnival. I have never been on a ship, actualy I’m taking my first cruise in 3 weeks, which is the Oasis of the seas. I’m pretty sure that I will love the experience and want to sail again, but no matter how cheap it could get to be, I would never get in on a carnival ship.